The last time I purchased web design services (several years ago), my law firm paid $10,000 for one designer to prepare three homepage concepts. I disliked all of them. The designer was good and the designs were not bad. But my choices were limited and the designs looked like 99.9% of the sites on the Internet. I thought at the time that there had to be a better way. Here are some of the amazing statistics from our homepage project. We wondered whether we could get enough concepts for our homepage design in a 3 week period. 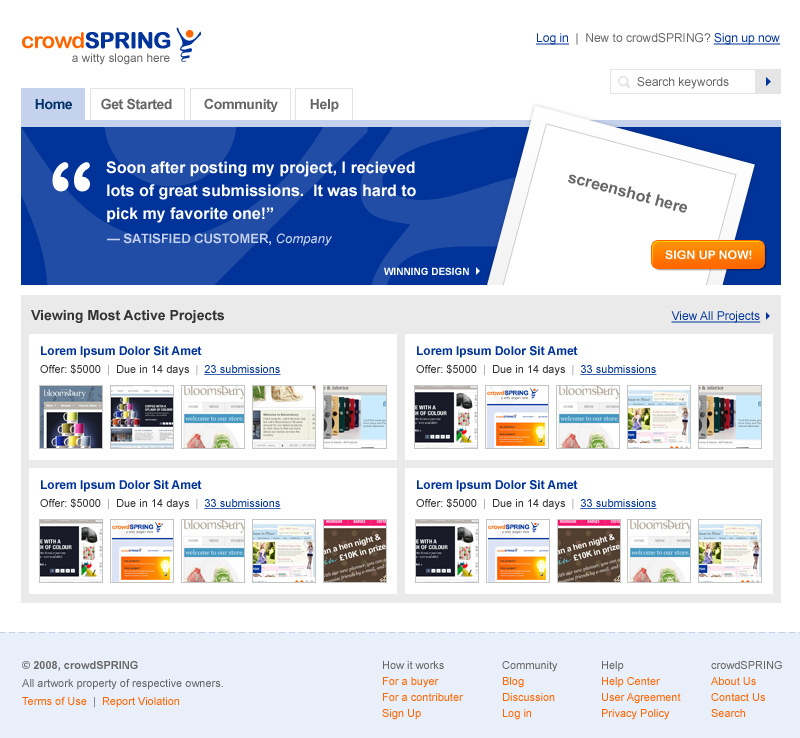 We decided that if we would ask buyers to post projects on crowdSPRING – we had to prove that we would eat our own dog food. Yummy! We are absolutely thrilled with our homepage design project. Every day for three weeks, we met as a team and over lunch, provided feedback to all participants. It was a fun process. Imagine choosing from 337 concepts! The winning design was from a student (studying graphic design) from the Netherlands. We did not know he was a student until after we selected his design. If we followed the traditional model, we never would have hired him, because as a student, he lacks relevant experience. On crowdSPRING, only his work matters. We absolutely love his designs, iteration, execution, and professionalism. We didn’t care if he was a retired designer, a professional, a homemaker, a student or a janitor (more on that later). One of the runner-up designs was submitted by a Canadian designer. The other runner-up design was submitted by a British designer. Some of you might not know that our logo was designed at the end of 2006 by a designer (intrepidguppy) who was then (and continues to be) a janitor working the night shift (he lives in Canada). He is an outstanding graphics designer and is an active participant on our invite-only beta site. When we first selected his design at the end of 2006, we did not know he worked full time as a janitor. We never would have picked him to design our logo had we known that. But his work speaks for itself and can stand proudly against some of the best professionals out there. His portfolio is outstanding, his clients are happy. He is able to do something he loves – create wonderful designs for people around the world. Not bad for proof of concept: Logo designed by a janitor. Homepage designed by a student. Their talent amazes us. Our invite-only beta is progressing very well. We’d love to open the doors and let the world look (just a little while longer…), but want to first make sure that everything works. Our small group of beta testers has been absolutely outstanding in helping us test, improve, and create the foundation for a great community. 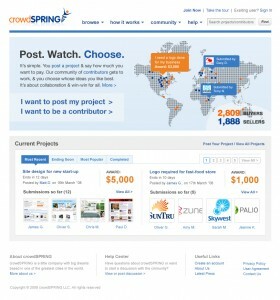 We’re very fortunate to have creatives from across the world help us test the crowdSPRING marketplace. And the winners in the various projects in beta emphasize how diverse our small but growing community has become. In the few short weeks that we’ve been in a closed beta, numerous real projects have been completed. Winning designers come from countries around the world – Singapore, Serbia, Canada, Philippines, India, Netherlands, England, Argentina, Romania, and the United States, among others. 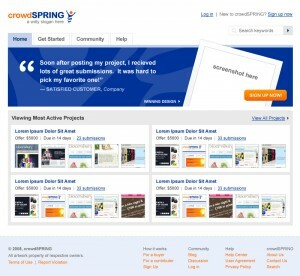 They’ve earned thousands of dollars in winning projects (and clients) and have given us many, many suggestions on how we can improve crowdSPRING. We are greatly indebted to them for their contributions. We look forward to throwing the doors open in April to invite the rest of the world to take a look. We think you’ll be pleased!